Online gift registries have become more and more popular with brides in recent years. Why? Well, traditional wedding registries aren’t as useful as they once were. Couples often already have the stuff you would typically register for, so they want to think a little outside the box with an online registry. Also, online gift registries make life a lot easier for everyone IF they allow you to add gifts from any store. This saves you the hassle of having to start (and keep track of) multiple registries at multiple places. 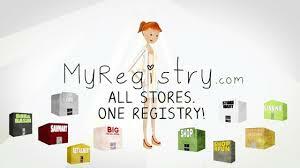 Instead of limiting yourself to a few stores, MyRegistry lets you add gifts from anywhere – even offline stores. All of your gifts are easy to see on your online registry, which guests can peruse by item category or just browse around. For online stores, you can add gifts with just a click of a button. For offline stores, you can add items yourself. Easy-peasy! So, you want a new living room set? A new mattress? These are expensive gifts that go way beyond the average wedding gift price tag – but one of the biggest perks of MyRegistry is that it allows guests to contribute a portion of your pricier gifts, rather than just having to go the “all or nothing” route. You are far more likely to get these items this way, as opposed to crossing your fingers that someone wants to drop several hundred (or thousand) dollars on your wedding gift all by themselves. The process isn’t quite as seamless for buyers as it is on most ordinary online registries. Once the guest has purchased an item, they often have to click a button in the pop-up window to alert the recipient that someone has bought the item. If the guest forgets to click this button, the recipient won’t know that the item has been purchased, which could result in duplicate gifts. Is Myregistry.com worth it? It’s hard to argue with something that costs only $1.99. I liked being able to add items from many stores and automatically compare prices to find the best deal.